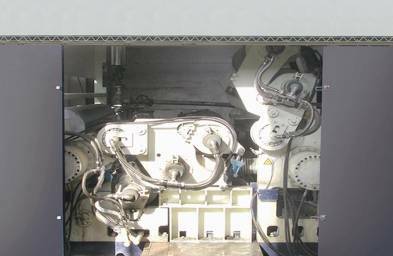 Glue Making System, and Electric Control System etc. facer, and then it is agglutinated with another paper roll to form a piece of single face corrugated cardboard. conveyed out. An entire working procedure of the production line is completed. with characters of decentralization-control and multi-persons control. production is realized,and orders can be changed without stopping machine. can be listed and printed. 1. In the course of production, support and supply the scroll paper out. oil cylinders. And clamp, trans verse movement controlled by Φ63mm hydraulic pressure oil cylinders. 3. Might load and unload scroll without stop production. 4. 6 sets of hydraulic cylinders control. 5. Pneumatic control the tension and force the ABS brake tension force controlling system. 6. Fixed type and expanding type finial are available3inch and 4inch clamping part in mutual. 1. Max. Diameter of Scroll: Φ1500mm. 2. Max. Width of Scroll: 1400mm-2800mm. 1. Dual relax rollers structure, make more smooth of each splicing. 2. Effective splicing manner, make paper guide through very convenient all the same. get better agglutinate, ensure success ratio of splicing. 4. Higher stable success ratio of splicing is over 99%. 5. The machine could be upgraded from low speed type to high speed type. 6. Might connect by network with most production management system. 1.Heat raw paper or corrugated paper cardboard, control moisture of raw material. 2.Automati or electric control types are available for customers choice. 3.Fixed or rotational cylinders are available for choice. 4.Advanced round closure design, keeps the heat of paper even. 5.Heat cylinder diameter: Φ600mm, Φ900mm, Φ1100mm. 6.Effective breadth: 1400 mm, 1600 mm, 1800 mm, 2000 mm, 2200 mm,2500 mm, 2800 mm. 8. Might be equipped with sprayer to adjust moisture content of the corrugated medium paper. Inner Vacuum Single Facer Also call the corrugated machinery.It's vacuum suction single facer. 3.Flute Type: A, B, C, E, F, BC. 1.Applied to mid and high speed production line. 2.High pressure fan structure with silencer is used to reduce noise. 3.Adjust glue thickness electrically and display digitally. 4.The diameter of corrugating roll is Φ310mm, Φ320mm,Φ360mm, Φ430mm. The corrugating roll in made of special alloy steel, induction hardened. The roll is polished with heat treatment. Coated with chrome, the hardness of its surface reaches above SH75. roll is polished and coated with chrome. 6.Automatic, interval, circular and high grease provide reasonable lubrication. the press roll and the glue trough will withdraw. 8.Thickness of glue is controlled by the clearance between glue roller and doctor roller, by electyomotion or Automatic. A.Electromotion: Press the button that controls motor to adjust the clearance, to ensure paste enough glue. Speed; save poner, reserve I/O of computer management system. 2.Might be equipped sprayer, adjustable base paper humidity. 3. Flute Type: A, B, C, E, F, BC. 6. Automatic, interval, circular and high grease provide reasonable lubrication. reserve I/O of computer management system. 10. Might be equipped sprayer, adjustable base paper humidity. made of special alloy steel, induction hardened. The roll is polished with heat treatment. roll and the glue trough will withdraw. 8.Thickness of glue is controlled by the clearance between glu, e roller and doctor roller, by electyomotion or Automatic. Auto-controlling: The encoder and PLC auto-controls according the change of speed. And with inter-face. save poner, reserve I/O of computer management system. 1.This device is installed on the bridge of the production line, to tense cardboard. decks convey on the bridge. 2.Pa per width and transverse movement are adjusted by electromotion. 3.With vacuum suction device, the tension of cardboard is controlled adjustable. 4.With 2 sets of control panels, the operation may take place on the bridge or under the bridge. Safety fences at two sides and ladders are available. 1.Special meshes on the surface of the glue feeding roller, coated with hard chrome. 2.Pressing roll moves up and down pneumatically. A. Manual Controlling: Press the button that controls motor to adjust the clearance, to ensure paste enough glue. B. Auto- Controlling: The encoder and PLC auto-controls according to change of speed. Digital encoder adjust the clearance between the glue roller and the doctor roller. There is a digital indicator that makes the adjustment both convenient. Obvious and The micro-adjustment ensures that the glue is pasted to the corrugated paper very evenly which keep a stable quality of the paperboard. 4. Pressing roll and contact bar are available for pressing. 5.With own pre-conditioner accelerate gluing. 6.Each of the glue rolls are driven by separate transducer motors controlled by transducer, saveponer to ensures all rolls run with same pace, also could independentlg run. 7.Max. Width of Scroll: 1400mm-2800mm. heated in the double facer, and finally be made into 3-ply, 4-ply, 5-ply, and 7-ply cardboard. main drive, steam heating, and conden, sate water drain pipes and traps. of the cardboard , keep proper pressure, and is useful for the form of cardboard. whole machine in good working condition. thickness and plane of cardboard. producing speed. The heating plate is 160mm high 600mm wide. 5.Might equip automatic correcting and cleaning device for upper cotton belt. preparation time of order arrangement is 25 seconds. switch to finish change instantly. 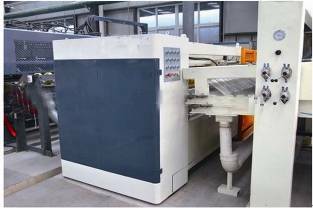 with 24 lines) to press more lines requirement cardboards. 6.While arrange order, select , anti-break scorer line type or plane scorer line type automatically. 1.This machine is applied to computer-controlled high-speed cardboard production line. It can save millions of orders. The specification of cutting is adjusted manually. 2.Balance treatment for blade shaft, which helps to keep its stability. and increases the cutting stability and the endurance of the blade. eases the abrasion, overheating, and noise. is stable and with even pressure, which prevent jam caused by broken cardboard. Applied to PLC lifting stacker and mainly used to transport cardboards to the stacker . of the production line . The speed adjustment is of high accuracy . by changing the speed, which saves time for stacker to output cardboard. With pressing wheels, it keeps cardboards to drop effectively and stack orderly. Manual and automatic control modes are available. Max.speed of the production line:180M/min-250M/min.